Mohammed Anwar Al Sadat (Arabic: محمد أنورالسادات Muḥammad 'Anwar as-Sādāt) (December 25, 1918 – October 6, 1981) was an Egyptian statesman who served as the third president of Egypt from October 15, 1970 until his assassination on October 6, 1981. He is considered in Egypt and in the West to be one of the most important and influential Egyptian and Middle Eastern figures in modern history. Sadat was a soldier who became a man of peace. Egypt and Israel had been in a state of war since 1948. Sadat himself had coordinated with Syria the 1973 Yom Kippur War against Israel, which although a surprise attack, he ultimately lost. In 1977, Sadat unexpectedly announced that “he was ready to go to the end of the world, even to the Knesset, in search of peace,” which led to his historical trip to Jerusalem. This led to the signing of the Camp David Accords and normalization of relations between Israel and Egypt. As a result, Egypt was expelled from the Arab League; no other Arab or Muslim country even recognized Israel's existence at that time. Sadat was co-recipient of the Nobel Peace Prize in 1978. In his Nobel Lecture, he spoke of the need to reconcile the sons of Ishmael with those of Isaac and of Egypt's heritage as one that valued coexistence over war. His assassins regarded him as a traitor to Islam for making peace with Israel. When he succeeded Gamal Abdel Nasser as president of Egypt, the men who surrounded him thought he would be easy to manipulate. This did not prove to be the case. On the one hand, his presidency attracted numerous allegations of corruption and did little to promote genuine democracy in Egypt. On the other, his peacemaking efforts with Israel changed the face of the Middle East, and represented the first breakthrough towards resolving the Arab-Israeli conflict in 30 years. Sadat was born on December 25, 1918 in Mit Abu al-Kum, al-Minufiyah, Egypt, to a poor family, one of 13 brothers and sisters. His father was Egyptian, his mother was Sudanese. He graduated from the Royal Military Academy in Cairo in 1938 and was appointed to the signal corps. He entered the army as a second lieutenant and was posted in the Sudan. There, he met with Gamal Abdel Nasser, and together, along with several other junior officers, they formed the secret, anti-British, anti-monarchy Free Officers revolutionary organization, committed to freeing Egypt from British control. During World War II he was imprisoned by the British for his efforts to obtain help from the Axis Powers in expelling occupying British forces. He participated in the 1952 coup d'état which dethroned King Farouk I. When the revolution erupted, he was assigned to take over the radio networks and announce the outbreak of the revolution to the Egyptian people. During the reign of Gamal Abdel Nasser, Sadat was appointed Minister of State in 1954. In 1959 he assumed the position of Secretary to the National Union. Sadat was the president of the Parliament (1960–1968) and then as vice president and member of the Presidential Council (1964). Sadat was reappointed as vice president again in December 1969. He survived the turmoil of Nasser's times by loyal obedience to him. Sadat ascended to the presidency after Nasser's death by very clever means. Considering him nothing but a puppet of the former president, Nasser's other associates settled on Sadat as someone they could easily manipulate. For months, he was known as “the donkey,” as he learned to control the levers of power. Nasser's past supporters were well satisfied for six months until Sadat instituted the The Corrective Revolution and purged Egypt of most of its other leaders and other elements loyal to Nasser. In 1971, Sadat endorsed in a letter the peace proposals of United Nations negotiator Gunnar Jarring which seemed to lead to a full peace with Israel on the basis of Israel's withdrawal to its pre-war borders. This peace initiative failed as neither the United States nor Israel accepted the terms as discussed then. Sadat likely perceived that Israel's desire to negotiate was directly correlated to how much of a military threat it perceived from Egypt, which, after its decisive victory in the 1967 Six Day War and conquest of the Sinai Peninsula and Golan Heights, was at an all-time low. Israel also viewed the most substantial part of the Egyptian threat as the presence of Soviet equipment and personnel (numbering in the thousands at this time). It was for those reasons that Sadat expelled the Soviet military advisers from Egypt and proceeded to whip his army into shape for a renewed confrontation with Israel. In 1973, Sadat, in collaboration with Syria, led Egypt into the Yom Kippur War against Israel, and succeeded early on in regaining parts of the Sinai Peninsula, which had been conquered by Israel during the Six Day War. However, three divisions of the Israeli army (IDF) led by General Ariel Sharon (later an Israeli prime minister) eventually crossed the Suez Canal and entrapped the Egyptian Third Army. It was at this time that Egypt's ally the Soviet Union demanded a cease-fire. While the territorial gains of Egypt in this war were limited, approximately 15 km into the Sinai desert in the first few days of the war, Sadat's initial victories eventually led to regaining and reopening the Suez Canal through the peace process with Israel in the years that followed, and restored Egyptian morale. Israelis now recognized Egypt as a formidable foe. Sadat, therefore, restored Egypt's political significance in the eyes of Israel with this attack. For many years after, Sadat was known as the "hero of the Crossing." On November 19, 1977, Sadat became the first Arab leader to officially visit Israel when he met with Israeli prime minister Menachem Begin, and spoke before the Knesset in Jerusalem about his views on how to achieve a comprehensive peace to the Arab-Israeli conflict, which included the full implementation of UN Security Council Resolutions 242 and 338. Much of the Arab world was outraged by the visit, due to their widespread view of Israel as a rogue state, and a symbol of imperialism. He made the visit after receiving an invitation from Begin and once again sought a permanent peace settlement. 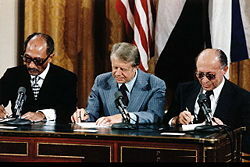 The Egyptian-Israeli Peace Treaty was signed by Sadat and Begin in Washington, DC, on March 26, 1979, following the Camp David Accords (1978), a series of meetings between Egypt and Israel facilitated by U.S. President Jimmy Carter. Sadat and Begin were each awarded the Nobel Peace Prize for signing the treaty. 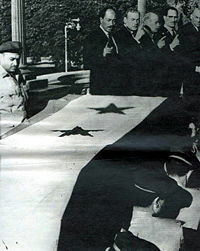 The main features of the agreement were the mutual recognition of each country by the other, the cessation of the state of war that had existed since the 1948 Arab-Israeli War, and the complete withdrawal by Israel of its armed forces and civilians from the rest of the Sinai Peninsula which Israel had captured during the 1967 Six-Day War. The agreement also provided for the free passage of Israeli ships through the Suez Canal and recognition of the Strait of Tiran and the Gulf of Aqaba as international waterways. The agreement made Egypt the first Arab country to officially recognize Israel. The peace agreement between Egypt and Israel has remained in effect since the treaty was signed. The treaty, which gained wide support among Egyptians, was extremely unpopular in the Arab World and the wider Muslim World. By signing the accords, many non-Egyptian Arabs believed Sadat had put Egypt's interests ahead of Arab unity, betraying Nasser's pan-Arabism, and destroyed the vision of a united "Arab front" and elimination of the "Zionist Entity." Sadat's shift towards a strategic relationship with the U.S. was also seen as a betrayal by many. In 1979, the Arab League expelled Egypt in the wake of the Egyptian-Israel peace agreement, and the League moved its headquarters from Cairo to Tunis. It was not until 1989 that the League re-admitted Egypt as a member, and returned its headquarters to Cairo. Many believed that only a threat of force would compel Israel to negotiate over the West Bank and Gaza Strip, and the Camp David Accords removed the possibility of Egypt, the major Arab military power, from remaining such a threat. As part of the peace deal, Israel withdrew from the Sinai Peninsula in phases, returning the entire territory to Egypt on April 25, 1982. The last years of Sadat were marked by turmoil and corruption allegations against Sadat and his family. Sadat promised the Egyptians prosperity after the peace treaty with Israel. Near the end of his presidency, most of Sadat's advisors resigned in protest of his internal policies. 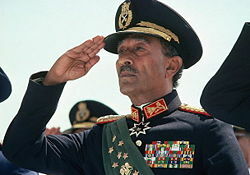 The mysterious deaths of the defense minister, Ahmed Badawi, and 13 senior Egyptian Army officers in a helicopter crash on March 6, 1981 near the Libyan border, increased the public anger at Sadat and his policies. In September 1981, Sadat cracked down on intellectuals and activists of all ideological stripes, imprisoning communists, Nasserists, feminists, Islamists, Coptic Christian clergy, university professors, journalists, and members of student groups. The arrests totaled nearly 1,600, receiving worldwide condemnation for the extremity of his techniques. Meanwhile, internal support for Sadat disappeared under the pressure of an economic crisis and Sadat's suppression of dissidents. 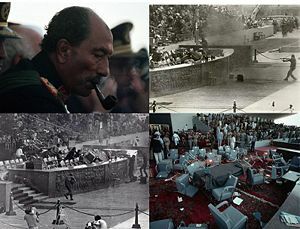 On October 6, the month after the crackdown, Sadat was assassinated during the annual victory parade in Cairo. The assassination was carried out by army members who were part of the Egyptian Islamic Jihad organization. They opposed Sadat's negotiations with Israel, as well as his use of force in the September crackdown. As Egyptian air force jets flew overhead, distracting the crowd, a troop truck halted before the presidential reviewing stand, and a lieutenant strode forward. Sadat stood to receive his salute, whereupon the assassins rose from the truck, throwing grenades and firing assault rifle rounds. Sadat was shot in the head where he stood and fell to the floor; people around him tried to protect him by throwing chairs to cover him from the bullets. The assassination operation took around two minutes. Two of the attackers were killed and the others were arrested by the military police on site. The assassin, Khalid Islambouli, shouted "Death to Pharaoh!" as he ran towards the stand and fired at Sadat. He was later found guilty and executed in April 1982. As the crowd of dignitaries scattered, many were wounded, including James Tully, the Irish minister for Defence, and four U.S. military liaisons. This was the first time in the Egyptian history that the head of the Egyptian state was assassinated by Egyptian citizens. In the ensuing firefight, seven people were killed, including the Cuban ambassador and a Coptic Orthodox bishop, and 28 were wounded. Sadat was then rushed to a hospital, but was declared dead within hours. He was succeeded by his vice president, Hosni Mubarak, whose hand was injured during the attack. Mubarak remains president today. Sadat's funeral was attended by a record number of dignitaries from around the world, including a rare simultaneous attendance by three former U.S. presidents, Gerald Ford, Jimmy Carter, and Richard Nixon. No Arab leaders attended the funeral apart from Sudan's president, Gaafar Nimeiry. 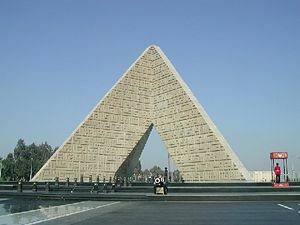 Sadat was buried in the unknown soldier memorial in Cairo. A fatwa approving the assassination had been obtained from Omar Abdel-Rahman, a cleric later convicted in the U.S. for his role in the February 26, 1993 World Trade Center bombing. Sadat was protected by four layers of security and the army parade should have been safe due to ammunition-seizure rules, however the officers in charge of that procedure were on hajj to Mecca. Over three hundred Islamic radicals were indicted in the trial of assassin Khalid Islambouli, including Ayman al-Zawahiri, Omar Abdel-Rahman, and Abd al-Hamid Kishk. The trial was covered by the international press and Zawahiri's knowledge of English made him the de facto spokesman for the defendants. Zawahiri was released from prison in 1984, before traveling to Afghanistan and forging a close relationship with Osama bin Laden. Sadat was married twice. He divorced Ehsan Madi to marry half-Egyptian/half-British Jehan Raouf (later known as Jehan Sadat), who was barely 16, on May 29, 1949. They had three daughters and one son. Jehan Sadat was the 2001 recipient of Randolph College’s Pearl S. Buck Award. Sadat's autobiography, In Search of Identity, was published in the United States in 1977. Jehan Sadat is an associate resident scholar at the University of Maryland, where the Anwar Sadat Chair for Development and Peace was established and fully endowed in 1997 to honor her husband's legacy. A nephew, Talaat Sadat, was imprisoned in October 2006 for accusing the Egyptian military with complicity in his uncle’s assassination. In 1983, Sadat, a miniseries, aired on U.S. television with Academy Award-winning actor Louis Gossett, Jr. in the title role, though it was temporarily banned by the Egyptian government due to historical inaccuracies as reported by a former officer in the ministry of the interior, Ahmed Y. Zohny, who was a Ph.D. candidate at the University of Pittsburgh at the time. The two-part series earned Gossett an Emmy Award nomination. The first Egyptian depiction of Sadat's life came in 2001, when Ayam El-Sadat (English: “Days of Sadat”) was released in Egyptian cinemas. The movie was a major success in Egypt, and was hailed as Egyptian actor Ahmed Zaki's greatest performance to date. ↑ Dan Cohn-Sherbok and Dawoud El-Alami. The Palestine-Israeli Conflict (Oxford: Oneworld, 2001), 169. ↑ R-MWC – 2001 Pearl S. Buck Award Winner Jehan Sadat. Randolph College. Retrieved July 2, 2007. ↑ Adel Darwish, “Obituaries and Profiles: Ahmed Zaki: ‘Black Tiger’ of Egyptian film,” Mideastnews, March 31, 2005. Retrieved July 2, 2007. This page was last modified on 7 April 2016, at 19:15.